In Jesus' parable of the Vineyard, the landowner represents God Himself. The servants represent messengers sent by God. The son represents Jesus. The harvest of grapes represents souls. In this story from Jesus, all messengers of God, including God's only human son, are killed. To fully understand God, you need to understand the fact that God sent His only begotten human son Jesus Christ as another "Messenger." "There was a man who owned a vineyard. The verse above is from the New Century Bible (NCV). Christians often hear about the second coming of Jesus, but few realized that God Himself comes back. In the above story, Jesus indicates that God, the Vineyard owner, will come back. We also read that God comes back in Isaiah. All humans [flesh] have not yet seen God's glory together, so this event is yet to occur. "You are My witnesses," says the Lord, And My servant whom I have chosen, that you may know and believe Me, and understand that I am He. Before Me there was no God formed, nor shall there be after Me. I, even I, am the Lord, and besides Me [God] there is no Savior." This verse may disturb some Christians who hold onto the false belief in a triune god and salvation only through the god Jesus. The Bible does not teach this lie; the orthodox doctrinal church teaches it. 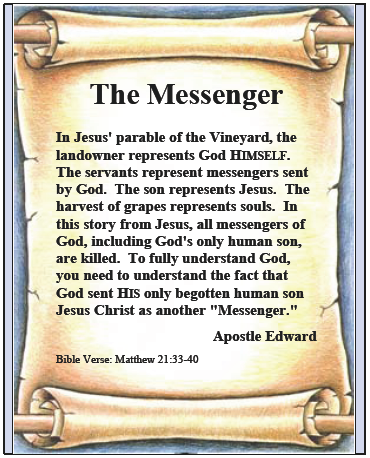 This tract highlights some characteristics of Jesus Christ, "The Messenger" of God. It starts out by acknowledging that there is only one God who is Savior of mankind. Jesus teaches that God granted him the ability to provide salvation [Eternal Life]. In the above words of Jesus, we learn that God has granted Jesus the ability to provide salvation to souls. So, while salvation only comes from God, He has granted authority to Jesus to give eternal life to those souls who believe in him and obey his gospel. We also read this fact in the book of Revelation. This means there are TWO PATHS to Eternal Life. One is directly from God and the other comes through faith in His human son Jesus. It is Jesus who states the above reality of eternal life. IF you believe in the God who sent "The Messenger" Jesus, you already have passed into eternal life and did so without any judgment. So, what if you don't believe Jesus was sent as a messenger, but believe he is God? Well, Jesus gives us that answer. Jesus says he will pick you up on the "Last Day" for judgment. There is a difference "The Messenger" Jesus makes between believing in "the God who sent him" and in just believing in him. Have you heard about the Last Day Pickup Plan? "I am the bread of life. He who comes to me shall never hunger, and he who believes in me shall never thirst. But I said to you that you have seen me and yet do not believe. All that the Father gives me will come to me, and the one who comes to me, I will by no means cast out. For I have come down from heaven, not to do my own will, but the will of Him who sent me. This is the will of the Father [God] who sent me, that of all He has given me I should lose nothing, but should raise it up on the last day." Jesus offers us two very odd teachings on how to gain eternal life. First, you could believe in the God who sent Jesus and that he was a messenger [Son] in which case you get a "pass" into heaven that bypasses any judgment. Now, belief in this instance does imply adhering to God's ways & commands. In the second teaching, you just believe in Jesus and he will "raise you up on the last day." Here are some additional teachings of Jesus on God's Last Day Pickup Plan. Jesus said: "Whoever eats my flesh and drinks my blood has eternal life, and I will raise him [or her] up at the last day." This last verse is of course only a metaphor. We do not literally eat flesh or drink blood. This statement means that we instead take on Jesus' burden to reach lost souls. We emulate Christ who becomes our teacher. By following Christ's example, we become obedient to God's commandments. God showed me His "Last Day Pickup Plan" several years ago. However, it was only recently that God explained it to me in a way that I could fully understand. It was at my dear friend Vernon's funeral. As I sat there pondering my friend, who died at the age of 82, God spoke to my spirit clearly and indicated to me that John 5:24 applied to Vernon, because Vernon knew his God. This is to say that Vernon knew who God was and he knew that Jesus was a messenger sent by God. Vernon knew and believed the teachings of Jesus in this regards. Vernon also knew the teachings of Jesus that make it clear he was just a messenger sent by God. These are very simple words from Jesus. He speaks of the God that we all served. Is it important to know God and that Jesus is not God, but was just a messenger? Yes, it is and the answer is in 2 Thessalonians 1:8. As I was leaving Vernon's funeral, I stopped to thank the friend who gave his eulogy. He was well versed in Scripture. I told him that John 5:24 applied to Vernon. That Vernon had passed into heaven without judgment. Then I heard a strange reply.He replied: "Of course, all Christians are not judged." It was God's way of showing me the apostasy and lack of understanding of His Son within Christianity at large. I let it go, because a funeral is not a time to debate anyone about God's Holy Word. The eulogist's statement that all Christians are not judged was his Church indoctrination and Church dogma and not the word of God. Graphically, we see Jesus has taught us this. In the teachings of Jesus, only one group gets a pass into "everlasting life, and shall not come into judgment." It is not my words but the words of Jesus in John 5:24. This group represents all people who know God and are righteous in His eyes. This could include people who do not know Jesus or for that matter may not know much about Jesus. In contrast, everyone who knows Jesus, but does not know the God that sent him will be "picked up at the last day" for judgment. Why are Christians judged? Well, not all will be. However Jesus makes it clear that many who call upon him will not get into heaven. He states this clearly in Matthew 7:21-23. Jesus also gives us the reason. Those who he rejects as never having known were "lawless." They did not obey God. Jesus Christ will pick you up on the last day if you do not know God Almighty, the God who sent Jesus. This "last day" refers to the Day of Judgment. If you die before this last day occurs, your soul will go into a holding place until that time occurs. This is what I believe at this time. I know that Jesus has taught us that those who know his God, "has everlasting life and shall not come into judgment, but has passed from death into life." Is this you? Do you know God? In John 12, Jesus tells us what will judge those who are picked up on the last day. Jesus' words will judge everyone picked up on the last day. I will cover Jesus' judgment in more detail in my next tract writing called "The Message." Can you see from the above teachings of Jesus that the Church has altered the message he brought to us some 2,000 years ago? Let's examine some more characteristics of "The Messenger" Jesus from his own words. 2. God gave Jesus a purpose. 3. Jesus only did the will of God. 4. Jesus did nothing on his own accord. 5. Jesus came from Heaven to do God's will. 6. Jesus must perform the works of God. 7. Jesus' doctrine was God's, not his. a. Jesus said: "My doctrine is not mine, but His who sent me." 8. God was greater than Jesus was. 9. Jesus spoke God's Words, not his own. 10. Eternal life was to know Jesus' God. Of course, Jesus taught many other things, but you cannot understand Jesus' teachings unless you understand that he was not God, but a messenger of God sent to give our souls another opportunity for eternal life. Jesus left this earth more than just a great messenger of God. He also gave up his own human life as a perfect sacrifice for our sins. In many teachings, Jesus spoke in spiritual metaphors. To understand such teachings, you have to use your spirit not your senses. When Jesus said in John 12:45: "He who sees me sees Him who sent me" – Jesus used a spiritual metaphor. Jesus was telling us that if we really saw who he was "with our spiritual eyes" that we could see God Himself spiritually from within Jesus. Thus, if we engage our spirit, having been born again of the Spirit, we see clearly God sent Jesus. Another key to understanding a true believer in Jesus is given in this verse. Jesus states in this verse that you would believe in the God who sent Jesus if you really believed in Jesus. Think about this! The story of our Lord Jesus Christ is a very compelling one. God sent His only human begotten Son as a perfect sacrifice for the sins of mankind. It was God reconciling mankind so His need of perfect justice could be satisfied. Jesus' human sacrifice became not only atonement for the sins of mankind, but also our human example to follow. Jesus taught us to worship only the Lord God who sent him. He would be greatly disturbed by all of the churches that now worship him instead of his God. Jesus taught us to worship his God in Matthew 4:10 and in other verses. If you want Eternal Life, get to know the God that sent Jesus as "The Messenger." Only then will you have truly received the message of our Lord Jesus Christ. If you are an astute student of the Bible, this discussion of "The Messenger" may have raised more questions for you than it gave you answers. This is good. It will help you bring out the truth by studying God's Word, especially the Scriptures cited. Could there be any salvation or eternal life without actually coming to know God and not just Jesus? Let's put it this way. Do you believe you can mouth Jesus as your savior and get into Heaven? Or is there more to it? If you haven't found the God who sent Jesus, claims of faith in Jesus are most likely unfounded. Jesus calls us to obey his God!Study the Scriptures cited in this booklet very carefully. While in the Spirit, God gave these Scriptures to me for your benefit.